When I saw this t-shirt on Snorg, I immediately knew that I was going to buy it for myself. Things didn’t quite work out that way though – I showed it to Becca, she loved it too, so I bought it for her instead. There’s been some controversy about whether Pluto is a planet or not over the last few years, and whilst it was finally decided a couple of years ago that it wasn’t, I still believe in my heart that it must be one. Our teachers wouldn’t have told us things that weren’t correct at school, would they? Oh, and the earth is flat. 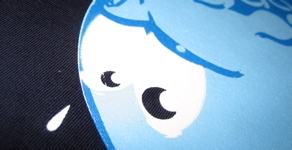 The thing I particularly love about this tee is the tiny tear that Pluto is shedding. It’s not overly aggressive, it’s not in your face, it’s just sweet. 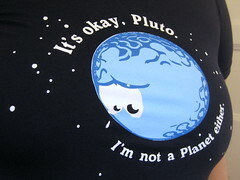 “It’s okay Pluto, I’m not a planet either” is available from Snorg Tees for $16.95. It’s printed on an American Apparel shirt, and is available in both male and female styles.